You are able to set up product feature by following the instructions below. Name – type the name of your feature, for example Manufacturer. 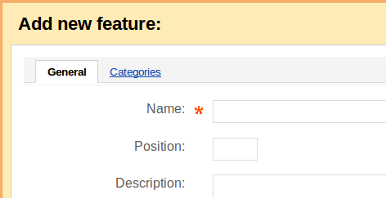 Position – type the position this feature will have in the list of features. Description – describe your feature, customer will see this description if he just clicks on ? link under the Features tab on the product details page. Others - Text, Number, Date. Group - select group you want this feature to be applied (leave None if you don't want to apply feature to any group). Product – tick this box in case you want the feature to be displayed on product details pages. Catalog pages – tick this box in case if you want the feature to be displayed on product list pages. Prefix - enter feature prefix. Suffix - enter feature suffix. Name – type the name of your feature group. Description – describe your group, customer will see this description if he clicks on ? link under the Features tab on the product details page. Product – tick in case you want to display group on product details pages. Catalog pages – tick in case you want to display group on product list pages. Open the Categories tab at the top of the window Add new feature. Click on the Add categories link. This will open a window with a list of categories. Tick the check boxes opposite to categories for which you want this group to be available. Click on Add categories and close when it's ready. Click on the necessary product link or Edit button. Select the necessary feature variant(s) in the features list and click on the Save button.